“The Haunted Fort” rises from the darkness to terrify the innocent and play its sinister games with the minds of those who dare to visit. Those brave souls know that Haunted Fort delivers a scare unlike any haunted place in the region. We DO NOT recommend you should participate if you are pregnant, have extreme claustrophobia, are prone to seizures, and/or have heart or respiratory conditions. **Due to the nature of the historic buildings, and surrounding grounds. All areas of the mazes and haunted attractions are not wheelchair accessible. - No photography or videography is allowed while in a maze or Haunted Attraction. 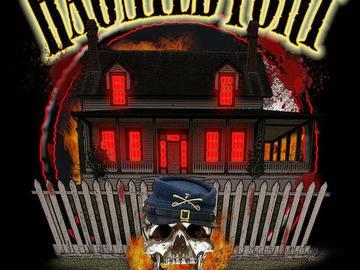 - Disorderly conduct, touching of staff,props, sets, and decorations, and demeaning actors while touring Haunted Fort is NOT allowed and you will be removed. FOR THE SAFTEY AND PROTECTION OF OUR VISITORS, STAFF, AND VOLUNTEERS. PARK LAW ENFORCEMENT HAVE THE RIGHT REFUSE ENTRANCE OR TO REMOVE ANYONE FROM THE EVENT NOT FOLLOWING POLICIES OR STAFF INSTRUCTION AND/OR TO REDUCE THE RISK OF INJUY.